A black leather biker jacket and an Armani Collezioni Faux Fur Wrap Shawl from Nordstrom are absolute must-haves if you're putting together an off-duty closet that holds to the highest fashion standards. 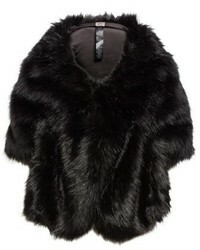 This combo of a black fur jacket and an Armani Collezioni Faux Fur Wrap Shawl from Nordstrom is a safe and very fashionable bet. Black suede platform loafers are an effortless way to add an added touch of chic to your look. A black coat and a black shawl are both versatile must-haves that will integrate well within your casual wardrobe. Add an added touch of elegance to your outfit by slipping into black leather ankle boots. This combo of a grey biker jacket and an Armani Collezioni Faux Fur Wrap Shawl from Nordstrom speaks comfort and definitely sass. If you want to feel a bit fancier now, introduce a pair of grey low top sneakers to the equation. Consider wearing a black coat and an Armani Collezioni Faux Fur Wrap Shawl from Nordstrom, if you prefer to dress for comfort but also like to look stylish. Complete this ensemble with hot pink suede low top sneakers and off you go looking incredible. A white crew-neck t-shirt and a black shawl will add extra style to your casual arsenal. Add grey leather pumps to the equation to spice things up. Exhibit your styling chops by putting together a beige trenchcoat and an Armani Collezioni black shawl for a relaxed casual outfit. To give your overall outfit a more casual aesthetic, why not complete this ensemble with white athletic shoes? If you appreciate function above all else, wear an olive fishtail parka and an Armani Collezioni Faux Fur Wrap Shawl. And if you need to easily dress up your outfit with a pair of shoes, enter a pair of black leather mid-calf boots into the equation. If the situation allows off-duty style, consider pairing a black tweed jacket with a black shawl. Add a pair of black suede over the knee boots to the mix to take things up a notch.